Refreshing afternoon thunderstorms are a possibility this weekend in Big Bear Lake, but not to worry, they usually only last a short time and then it clears up once again. Highs will be in the low 80’s. Perfect temps for your mountain getaway! 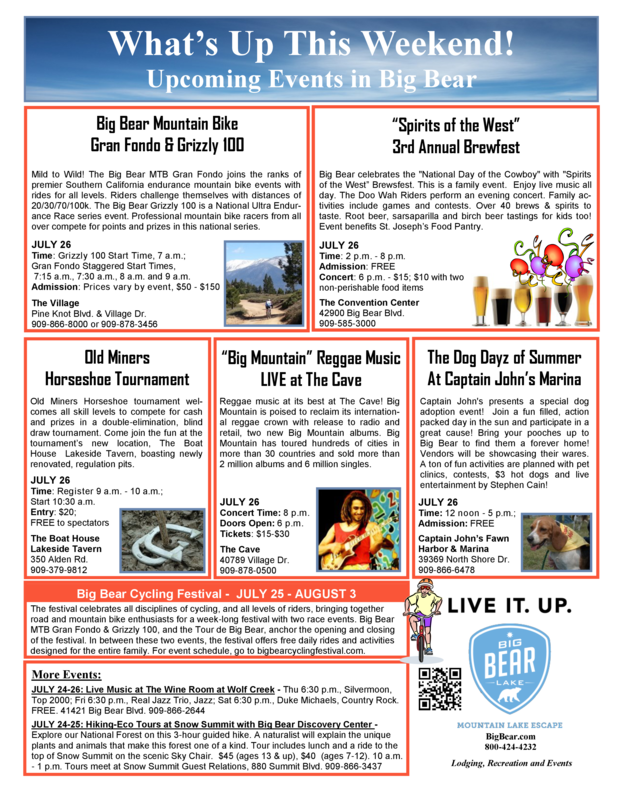 This weekend marks the start of the Big Bear Cycling Festival, which will have cycling information, vendors, rides and activities for the whole family. The event lasts for an entire week, so be sure to check out the schedule of events which I posted in Tuesday’s post HERE. There will also be live music at The Cave, some Old Miner’s Days events and the 3rd Annual ‘Spirits of the West’ Brewfest at the Convention Center. This is a family event, with a selection of Root Beers to sample as well as adult spirits. If you have room in your heart and your home for a furry, 4-legged family member, be sure to head over to Captain John’s Marina on Saturday for the Dog Dayz of Summer Event. There will be dogs that are looking for new families and fun for the family! We have cabins available for this weekend and beyond, so be sure to check out our selection at RSVacations.net and book that Big Bear Vacation Cabin. See you soon! !